Students who participate in after school programs can reap a host of positive benefits academically, socially, emotionally, and physically. By partnering with schools and recreation programs in the Greater Rochester area, EarthWorks is able to provide enriching after-school programs. After school topics cover STEM learning, problem-solving, communication skills and more. 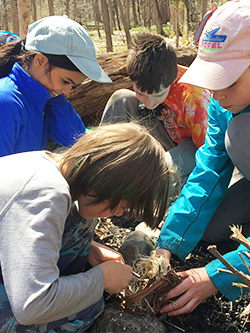 Thanks to our exceptional Experiential Learning Guides, we’re able to customize learning for specific age groups and give students the confidence to explore the outdoors in a safe and meaningful way. Find your class! 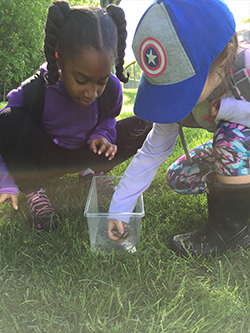 Our unique after school nature programs challenge students to experience the wonder of nature in their own backyard, and their connection to it. After school programs may be held at schools or in green spaces around the Greater Rochester area. Find the after school program that works best for your student! Students of Earthworks will master the four tenets of survival: shelter, water, fire, and food. Specific skills include outdoor cooking and safety, fire building (with friction), survival shelter building, wild sourcing of food and medicine, knife safety, and wild-crafting! Students will learn to think independently before reacting and make smart choices while being challenged. They also focus on developing life skills such as patience, respect, resilience, and teamwork. Designed especially for young learners, Earthworks brings your student into the world where they are free to discover and feel at home in the woods. Learning without knowing they are even in a class, students will learn basic wilderness safety, hiking skills, natural navigation, food, hydration, shelter building & more. Our curriculum combines unique outdoor games with challenges that give children the confidence to discover the outdoors in a safe and meaningful way.